The family-run Urban Family Brewing in Seattle’s Magnolia neighborhood has stealthily crept under the radar for several years. Now it’s finally getting the recognition it deserves with its approachable atmosphere (think board games and old school video games), food trucks that circle through, and — namely — by brewing some of the best small-batch sour beers in Seattle. 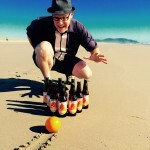 The brewery just announced their plans to move across the Ship Canal to join the Ballard brewery district. “The team at Urban Family is grateful to the Magnolia community for their support, and will miss being in the neighborhood,” owner Andy Gundel said in a press release. “But the new facility provides unparalleled opportunities.” The new location will allow for a 20-barrel brewhouse, a large walk-in space, an expanded taproom and a larger outdoor area. Today, Peaks and Pints presents a flight of Urban Family sours we call Craft Beer Crosscut 2.6.19: A Flight of Urban Family Sours. Heart of Stone is Urban Family’s ever-evolving love affair with the ancient pairing of stone fruit and sour beer. In this new version the brewery drops the plum and replaces it with a higher ratio of peach. This fruit forward offering starts with bright apricot and peach flavors and finishes with just the right balance of acidity to keep your mouth watering while staying infinitely drinkable. 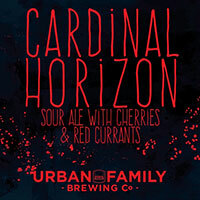 Urban Family Cardinal Horizon combines red currants and sour pie cherries, all fermented together on a wheated sour base. The currants begin the experience with soft aromas akin to fresh rose bushes or green raspberry leaves. The sour cherry additions then bring a rich depth of cherry pie flavor and end with just the slightest warming touch of cinnamon trailing from the cherry juice. 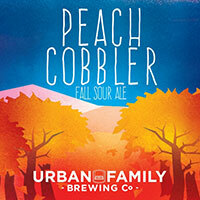 Urban Family Peach Cobbler is, well, exactly what it says. A robust amber colored tart ale, made with allspice, nutmeg, cinnamon, brown sugar, vanilla, and 1,250 pounds of fresh Washington peaches from Collins Family Orchards. Urban Family roasted the peaches for 6 hours in a large oven to allow the sugars to meld and caramelize together. Urban Family’s always evolving house saison fermented with a mixed culture of saison yeast and two different Brettanomyces strains. Even though this saison is ever changing in nuance, it will always be yeast driven, with a dry finish. 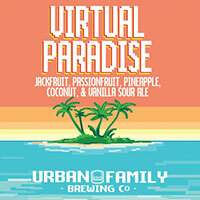 Urban Family Virtual Paradise is the “limit break” of tropical flavor. Brewed at the Magnolia brewery with Bottle Logic Brewing, the brewers boosted this beer up to juicy fruit levels using a combo move full of jackfruit, pineapple and passionfruit. This tropical medley resonates with juicy acidity and bright floral overtones. The toasted coconut shines through in the mouthfeel, giving off a textured mid-palate leading the way for a balanced touch of vanilla to smooth out alcohol.